It would be understandable if a person diagnosed with incurable cancer didn't feel like spreading joy to fellow patients in need of a smile. Katie Blunck, however, sees these encounters as "blessings in disguise." Katie Blunck needed to hear the 911 call. "I wanted to know what happened," she tells us. On the recording, Katie can hear herself talking to the 911 operator and responding to questions. "But I don't remember any of it," she says. "It's all blank." Minutes before, on Nov. 7, 2017, Katie's boyfriend had caught her as she fell in her kitchen, her face clenching tight and her voice emitting a frightening, ominous sound. "I had a seizure," Katie tells us. "My boyfriend called 911 right away. The only thing I remember is being loaded into the ambulance." 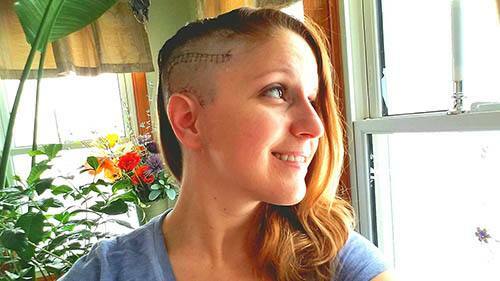 At a hospital in Sioux Falls, tests revealed a mass in Katie's brain. Five days later, after her doctors sent a portion of the tumor to the University of Minnesota for testing, Katie received a diagnosis. "They said it was anaplastic pleomorphic xanthro astrocytoma grade 3," Katie says. "It's a very rare cancer that my surgeon in Sioux Falls had never before seen himself." Her doctor's next move was to refer her to Mayo Clinic's Rochester campus, where Katie's Mayo care team "did some baseline testing and told me more about my tumor," Katie tells us. The news wasn't encouraging. "My oncology team at Mayo told me it's a very aggressive, very rare, very hard to kill form of brain cancer, and that it's ultimately incurable," she says. Surgery alone can't remove all of the cancer cells, so doctors turned to chemotherapy and radiation. After 30 rounds of proton beam therapy treatments at Mayo Clinic, Katie is now embarking on an aggressive chemotherapy regimen. The intensity of treatment will be monitored and adjusted by her care team. It's a lot to process, especially for someone who is just 32 years old. But Katie hasn't let it get her down. 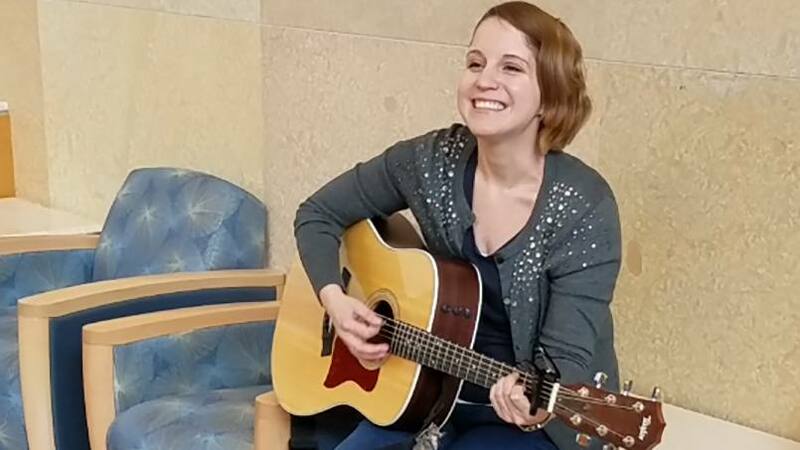 Instead, she's using her passion for music to help comfort other patients at Mayo Clinic. Like the young boy she met early on in his own proton beam therapy treatment. "I knew he was scared," Katie says. "I could see it in his eyes." So she walked over, introduced herself, and started a conversation and friendship that lasted throughout his time at Mayo Clinic. "His mom and I also became friends, and later she gave me a note that said, 'Katie, thank you for the kindness you showed my son that first day and every day after. We were so fortunate to meet you.' I cried when I read that," she tells us. And the fellow brain cancer patient for whom she sang a special song after his bell ringing ceremony earlier this month. "It was a song called 'Anyway' by Martina McBride," Katie tells us. "His wife had told me it's his favorite song, so I practiced it in the days leading up to his bell-ringing. I told the staff ahead of time that I'd like to do this for him," she says. "He was pretty touched by it." Those are the kinds of experiences Katie says she's looking forward to now that she's come to terms with her own medical situation. "This brain cancer has given me blessings in disguise because it's allowed me to meet many people at Mayo Clinic who I otherwise would not have met," she says. "They tell you at Mayo Clinic that attitude is everything, and that's very true. So now that I've worked my way through the stages of anger and denial, I've chosen to be as positive as possible. I've accepted my diagnosis and am now trying to make the best out of it by befriending as many new people at Mayo Clinic as I can for as long as I'm here." You can help make the most out of this story by sharing your comments below. Then, use the handy social media tools atop this page to share this story with others.